« Free Golf Holiday if McIlroy wins The Masters! In Spey Bay’s case this is a wonderful journey. 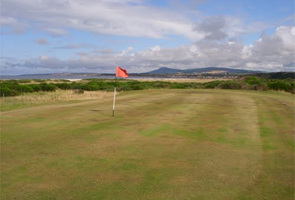 The undulating firm fescue fairways with gorse and heather in abundance and views over the Moray Firth, all play their part in this “sleeping beauty” of a classic natural links. 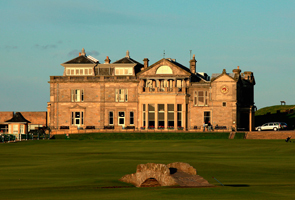 The layout resembles the Old Course at St Andrews with seven holes out, the loop, and then seven back in. Yes it’s short and now reduced to a par 70 with small greens but rarely does it enjoy a calm day, which ensures that the skills you acquire playing here will stand you in good stead to play anywhere. The course opens with three par 4’s which introduce you to the one of Spey Bays best features, the fescue clad shingle banks which you must plot your way across. The long 1st hole at 427 yards affords the luxury of a wide open drive which then leads you down to the green and enthusiasts of fine links turf will already be appreciating what awaits them. Holes two and three are shorter but full of character, aim for the Bin Hill in the distance and you’ll be fine, the only downside is that they are possibly too tight for their position on the score card. For reasons that will become very clear I’ll comment on the 4th 6th 12th and 13th later. The 5th, stroke index 1, which says it all, has a much more open drive than in years gone by but with a very undulating fairway and approach to the small green can prove very tricky with a long iron, the layout is more typically suited to a par 5. The 7th offers you a wide open drive, the first for a while and there is an interesting slope leading onto the green that can catch you out. In the summer this dries out and can insure that your next shot is from the gully at the back of the green. Some would arguably call the 8th the signature hole at Spey Bay, when you experience the 138 yard par 3 named Plateau the only advice I can give you here is keep your head down on your second shot. Signature hole or not you will not forget it. The 2nd hole at Royal Dornoch is tricky but nothing compared to Spey Bay’s 8th. Onto the 9th which comes with a change in direction heading back to the clubhouse, a short par 5 aptly named the Valley with out-of-bounds on the left and gorse on the right. On the card it looks like a birdie chance, but be glad of a five and walk to the 10th tee adding up your first nine, anything under forty and you’re doing well. The 10th completes the loop and then the tricky 11th, so typical of the shorter par 4s at Spey Bay, on the card it appears simple but treated it with a lack of respect and you will be left wondering where it all went wrong. The 14th, my favourite, was originally 300 yards and has been greatly improved with the addition of 105 yards making this a wonderful par 4, stroke index 2, with a fairway that would grace any Open Championship venue, a flattish green situated between two shingle banks that is normally approached from at an angle across the banks. You will see what I mean when you play it yourself. I always feel when playing a course for the first time the same as when watching a good film, I’m hoping for a really good ending, and Spey Bay delivers this with the last four holes, none of which are give aways, and into the prevailing wind will show you what you’re made of, so I’ll not spoil the ending and leave you to discover this for yourself. The only points of criticism I would mention, other than the new holes enforced by the coastal erosion is that the first six holes are too tight and unforgiving and that the first hole is about 30 – 40 yards too long. All too often the paying visitor or first time Open competitor is beaten before he has had a chance to reach the 7th tee, this does not encourage a hasty return. Also the majority of the greens are flat, however the 8th, 9th and 15th are not and watch out for the subtle ridge through the 18th green, a masterful touch by someone, long ago. Historically the lack of money available to maintain this course has actually helped to preserve its natural condition, no automatic watering system or expensive fertilizer budget. Yes more money would help with course alterations and the demands for Greenkeeping machinery, maintenance and in the overall upkeep, but the present Greenkeeper, Barry Cruickshank, has already worked wonders on a shoestring budget to rescue the greens during the 2011/12 seasons back to a very good putting surface. 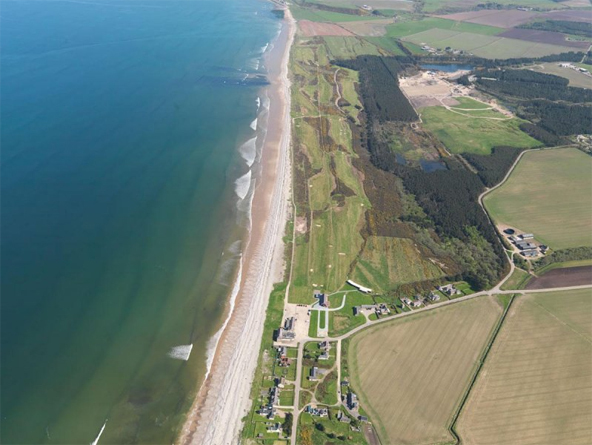 A local businessman has recently purchased the property which grants him the lease of the golf course, so hopefully this will be the start of great things for Spey Bay, never has a course deserved it more. No fancy ponds, no striped fairways to show which direction to play, no buggy tracks, no huge meaningless bunkers and no hiding behind the delusions of grandeur that come with a magnificent new clubhouse, just golf as it was intended to be played. Print article This entry was posted by Jerome on April 9, 2013 at 1:38 pm, and is filed under General. Follow any responses to this post through RSS 2.0. You can leave a response or trackback from your own site.